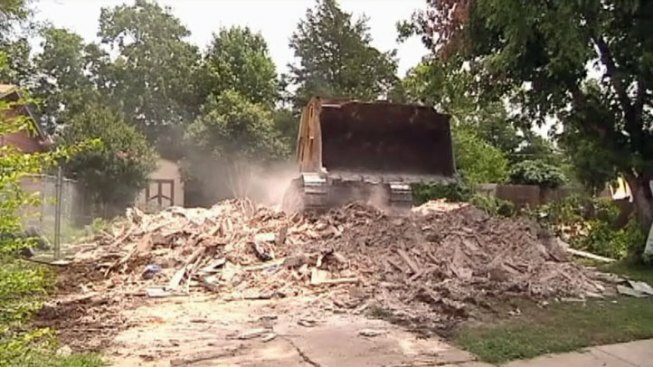 Thanks to a bulldozer and some demolition, a South Dallas couple said they are finally able to move on from last April's devastating tornadoes. "Now that it's finally happening, yeah, we can breathe a sign of relief now," Diane Wilmore said. She lived in the 3700 block of McLarty Drive in Dallas until a tornado threw two trailers into her house. "We were really, really like, 'Holy moly, look at this,'" Wilmore said. She said that what had happened eventually hit her and her husband as they began to assess the damage. "It was actually devastating to realize that your home that you've been in for years is destroyed in a manner of minutes," Wilmore said. The trailers caused $200,000 in damage. The Wilmores have insurance. Having coverage is one thing; ripping through the red tape of a mortgage company is another. "The wheels of progress were moving very slow for us," Wilmore said. But they seem to be finding some traction with Friday's demolition. "This is like the beginning of the end -- 'OK, we're starting new now,' so this is like getting a whole new starting life for us now," Wilmore said. The Wilmores plan to rebuild at the same address and hope to move in by the end of November. "How [are] you going to cook Thanksgiving dinner if you're not at home?" Wilmore said.